Sunset-pink flowers with a maroon eye. 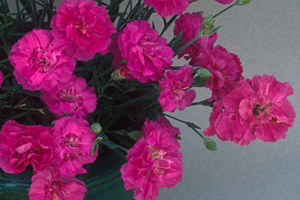 Very fragrant, semi-double, sunset-pink flowers with a long bloom time. Gray-green foliage. Great cut flower, bring the wonderful scent indoors. Can be used as a ground cover, along paths or in rock gardens.